Remember that huge snow storm we had on February 22nd and how we were buried in snow for three days? Spring arrived within a week! 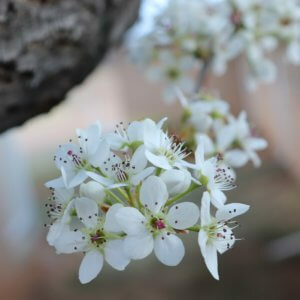 Our ornamental pear tree in the garth south of our church decided it just couldn’t wait to bloom any longer. 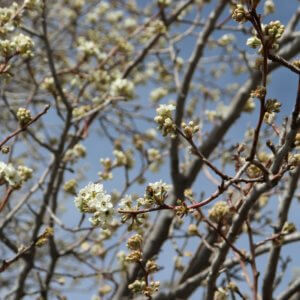 We’ve never seen it bloom so gloriously, but then again, it has been many years since we’ve had such a wet winter. We just had another storm March 11-12 which gave us over an inch of rain and dressed the Santa Rita Mountains in a fresh robe of snow. Thank you, God! The liturgical season of Lent began on Ash Wednesday, March 6, this year. Our faithful friend, Fr. 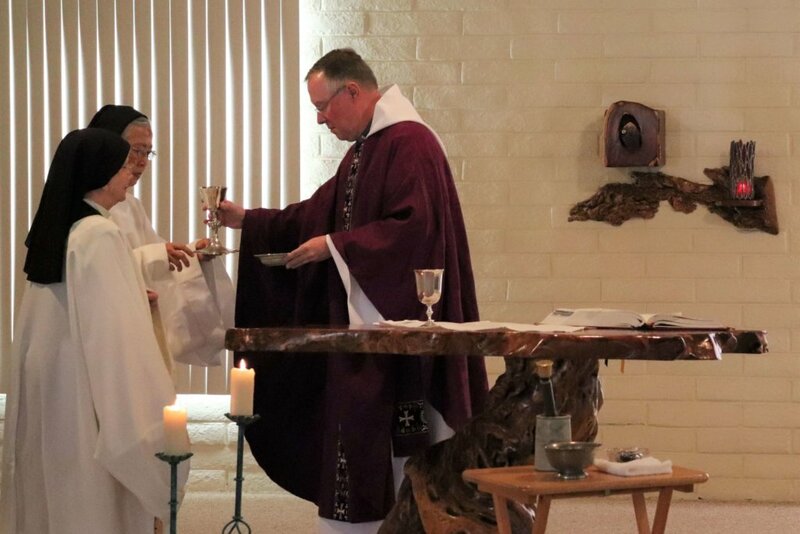 Olaf, was here again for his annual pre-Lent retreat and celebrated Mass for us daily, including on Ash Wednesday. Another part of Ash Wednesday is our Order’s custom of having only bread and water at dinner. Between the ashes on our foreheads from Mass and the fast day meal, we dove body and soul into Lent! There is a certain joy to Lent that’s hard to put into words. The Rule of St. Benedict refers to it in chapter 49: “The life of a monastic ought to be a continuous Lent. Since few, however, have the strength for this, we urge the entire community during these days of Lent to keep its manner of life most pure and to wash away in this holy season the negligences of other times. This we can do in a fitting manner by refusing to indulge in evil habits and by devoting ourselves to prayer with tears, to reading, to compunction of heart and self-denial … In other words, let each one deny themselves some food, drink, sleep, needless talking and idle jesting, and look forward to holy Easter with joy and spiritual longing.” Another Lenten custom in our Order is that of Lenten Reading. 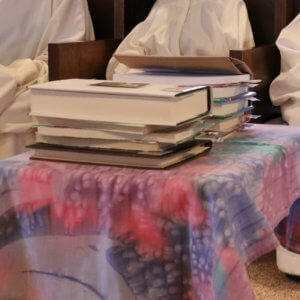 This also comes to us by way of the Rule of St. Benedict, in chapter 48: “During this time of Lent each one is to receive a book from the library and is to read the whole of it straight through.” Lenten books are chosen with care by each Sister and are given out in a special ceremony on the first Sunday of Lent. We pray that this Lenten season will be full of grace for us and for all of God’s children as we look forward to Easter with joy! 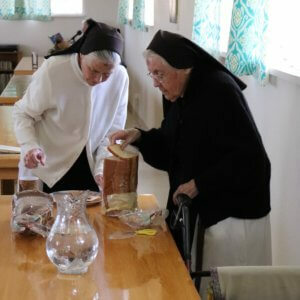 On Saturday, March 9, we shared a festive meal after Midday Prayer with Sr. Jeanne Bartholomeaux. 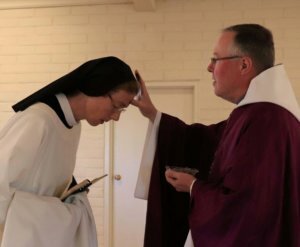 Sr. Jeanne is the Vicar for Vowed Religious in our Tucson diocese. We enjoyed hearing about some of the things the other religious in our diocese do in service to God and his people. We were especially interested in how the former Benedictine Monastery in Tucson is now being used as a way station for asylum seekers who have been granted entrance into the US. 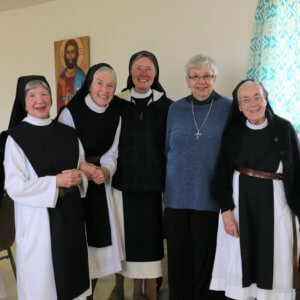 “I was hungry and you gave me something to eat, I was thirsty and you gave me something to drink, I was a stranger and you welcomed me.” (Matthew 25:35) In the photo Sr. Jeanne stands with our Sisters Jacqui, Kate, Mother Vicki, and Sr. Clare.